Jen Anisef helped change my life. When the workroom was just a hare-brained scheme in my head, I nervously attended a Craft Chat held by Toronto Craft Alert. 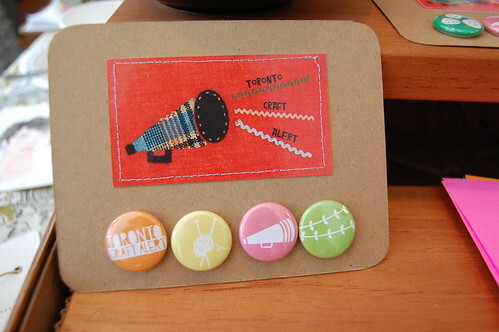 I had never interacted with Toronto’s craft scene in person, only lurked on local blogs and cruised a few craft fairs. I didn’t realize at the time, but this was a pivotal moment for me. Attendance to the Craft Chat was much smaller than expected, but the quality of people was stellar. This is where I first met Becky (Sweetie Pie Press), Leah (Cold Snap Bindery), Angelune (Toronto Craft Alert), Marnie (girl number twenty), Johanna (the workroom’s esteemed quilting teacher!) and Jen. The chat ranged on topics from the American vs. Canadian craft scene, rallying local resources, creating more dialog (online & in person), and etsy. Although I wasn’t ready at the time to share my business idea, I left feeling that this small group represented everything I hoped to bring together in the workroom. I think this is just one of thousands of examples of the positive impact TCA & Jen have made for so many people in our community. Toronto Craft Alert is just one of the major, local, craft-supporting projects that Jen is involved with. She is one third of the City of Craft team and one half of the Good Egg Industries team. 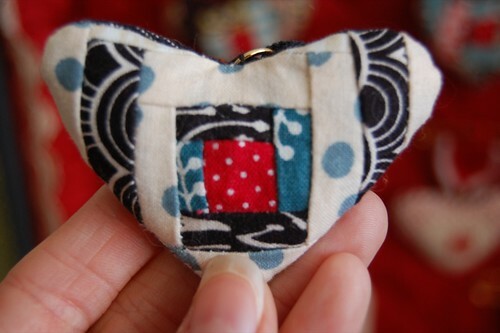 This crafty lady is truly remarkable and she makes a mean patchwork, to boot! Thank you, Jen for everything you do. 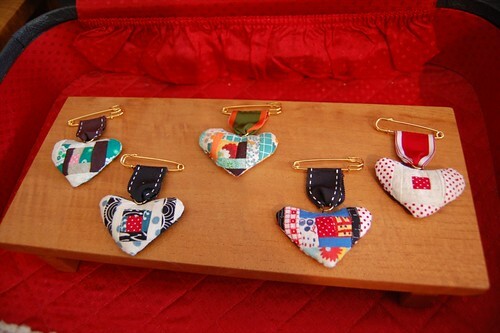 Jen will be at the Love & Rummage Trunk Show selling her irresistable log cabin heart medallions, plus City of Craft tees and totes. When did your life become all about craft? or has it always been that way? JEN : I have always made stuff & bossed people around with regards to making stuff. I organized a group of my ten year old friends in a crafty collective of sorts – hawking our fimo hairclips and brooches to shops! I didn’t begin to identify as artistic or crafty until about 1999 when I spent a year living in rural Japan where everyone and their grandmother is engaged in the act of making at most times, or at least in appreciating the natural creative beauty that surrounds them. I was fortunate enough to hook up with an English-speaking farmer buddy who drove me around the prefecture, translating interviews with craft artists of all different sorts including master weavers, washi makers and traditional indigo dyers. It was heaven and I realized then that I was in love with craft. All of your many projects are focused on the local craft scene – TCA, Good Egg, City of Craft… Why is this issue so important to you? JEN : I think in the early years of craft engagement I spent A LOT of time on craft message boards, communicating with people halfway across the world about crafty crushes, trading tips & techniques, and generally being excited that there were other people out there (often far out there) that shared my interests. Eventually, as the craft movement/subculture grew I was able to connect with people closer to home, and I felt that this more traditional form of community was something I needed to engage with to be fully satisfied – I loved being able to physically share & touch & smell & see & hear what people are doing. Don’t get me wrong, I think the online, cross-border connection is extremely valuable and inspiring, but I think there is an increasing desire among crafters & humans to move back towards the local and my projects are a reflection of that. You are a busy lady, what is next on the horizon for you? JEN : The most immediate thing is getting the re-designed Toronto Craft Alert site launched (so soon!) and a very juicy giveaway contest I am hatching to celebrate. Also, Toronto area peeps may be excited to know that we are bringing Handmade Nation to town on February 26th as part of the DIwhy? show at the Ontario Crafts Council. Stay glued to the City of Craft site for details. Finally (well, is there ever a finally?!) the other day while doing dishes a really exciting & possibly huge idea occurred to me but I need to sit on it for awhile longer before busting it out. I’ll just say it has to do with offering targeted support to entrepreneurs in Toronto’s booming craft world. I know how much you love colour and colour matching. Do you have a current favourite colour combo? JEN : Oh, that’s a tough one! If I were fifteen years old, I would say purple & orange without hesitating. Things have gotten a little more complicated since then…I love the combination of superbright, saturated & neutral colours. I’m starting to explore neons & pastels. If you had a day where you were not allowed to do any ‘work’ for all your ventures, how would you spend the day? JEN : When left to my own devices I am a pretty lazy gal…I would say sipping loose tea in sweatpants & reading my fantasy novel on the couch (got hooked on a recent trip to Cuba). Maybe followed by a potluck/clothing swap with friends which my husband would cook for! Are you planning on selling some rummage at the show? if yes, what might that be? JEN : I am planning to tackle my unruly fabric stash and emerge some scrap bags & larger pieces. I will also have some vintage clothing on offer and old craft hobby magazines. What Valentines gift would melt your heart? JEN : I am a sucker for a carefully orchestrated (re: colour palette) bouquet. Handmade (by him) jewellery would also weaken the knees. Jen, thank you for organizing that Craft Chat! I would never have met the cool ladies I know now if you hadn’t. What an important day that turned out to be!! I didn’t quite know what to expect, and I’m so glad I went. We all appreciate your hard work on behalf of Toronto craft. You are a STAR!! This event is on my list…hope to make it there.